... HAVE YOU EVER WONDERED WHY 'COOL' EXISTS? Herein lies the tale of a Kingdom unlike any other, in which we are told of the most remarkable King and his Kingdom. The ways of this King are such that, with the exception of one man, no one within his realm had ever felt the need to compare themselves to another. Until one day, unimaginable treachery takes place and the King is kidnapped by an evil usurper...The change this new circumstance brings is not what one might expect. A most strange, dangerous and even hilarious phenomenon that spreads throughout the land like yeast through baking dough... THE BIRTH OF COOL. How can this dilemma be dealt with? 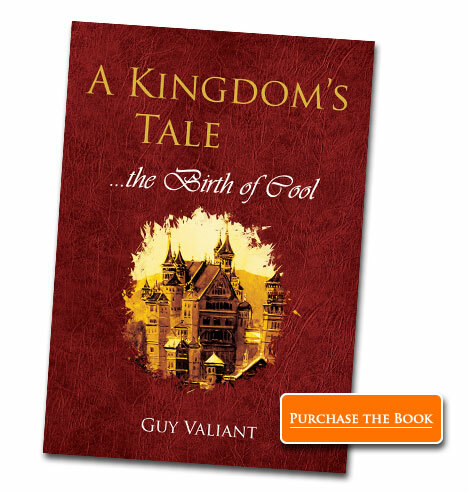 Join in the unqiue adventure as you enter into the lives of Prince Frederic, Princess Isabelle, Charlotte and Archie in Guy Valiant's first novel, A Kingdom's Tale: the birth of cool. Guy is a writer who has also repaired a great number of shoes. 'A Kingdom's Tale' is his first novel, which he aims to one day become a musical and animated film. He loves the power of good stories and lives on the Gold Coast, Australia.